Yellow spots and bands in winter on spruce shoots affected by Weir’s cushion rust. What is Weir’s cushion rust? 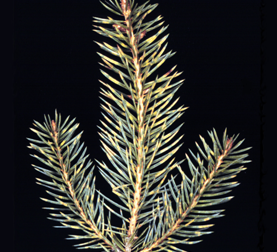 Weir’s cushion rust is a needle disease that disfigures and reduces growth of spruce trees (Picea spp.) of all ages. This disease has been known in both eastern and western regions of the United States, but was recognized in Wisconsin for the first time in 2002. What does Weir’s cushion rust look like? Needles on current year’s shoots affected by Weir’s cushion rust may develop yellow spots or bands in summer and fall. These spots and bands may intensify to give needles a bright “green and gold” appearance during the following spring, when tiny blister-like pustules also may develop in the yellow areas. Microscopic examination of these pustules is required for diagnosis of this disease. Affected one-year-old needles continue to yellow, turn brown, and fall off as spring and summer progress. Trees badly damaged by Weir’s cushion rust will have thin crowns due to repeated loss of the previous year’s needles. Where does Weir’s cushion rust come from? Weir’s cushion rust results from colonization of spruce needles by the fungus Chrysomyxa weirii. This fungus overwinters in needles infected during the previous growing season. In late summer, or more typically the next spring, Chrysomyxa weirii produces spores in tiny, blister-like pustules that develop on these needles. These spores can be blown by wind or splashed by rain to newly emerging needles on the same tree or other trees. Spore germination is followed by infection of young needles. Can I save a tree affected by Weir’s cushion rust? Fungicides containing chlorothalonil may be applied to trees affected by Weir’s cushion rust to prevent new needle infections. The first application should be made when 10% of the buds have broken and two additional applications should be made at seven to 10 day intervals thereafter. 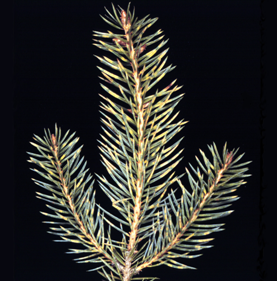 Fungicide applications do not kill the fungus in needles that are already infected, so it is important to begin applications promptly and to complete the spray program, to ensure thorough coverage of foliage. Please be sure to read and follow all fungicide label instructions to ensure that the fungicide is used in the safest and most effective manner. Needles infected by Chrysomyxa weirii the previous year will die, and the fungus will not continue to live or produce spores on dead needles. Therefore, destruction of dead needles is not necessary. How do I avoid Weir’s cushion rust in the future? Growers and homeowners should be careful not to accept nursery stock affected by Weir’s cushion rust, which may be present in wholesale or retail nurseries. Spruces in nurseries and the landscape should be carefully inspected in late summer and fall for yellow spots and bands on current year’s needles and in spring for these symptoms and pustules on the previous year’s needles. Affected trees should not be moved to areas where the disease is not already present. Preventative application of fungicides may prevent establishment of the fungus on new trees or in previously unaffected nurseries.